David Chang is losing his voice. It’s been a busy few days, even by Changian standards. In addition to darting between the seven restaurants he runs in New York, overseeing the six others scattered from Sydney to Toronto, plotting new ventures and partnerships and accommodating the usual army of journalists ravenous for his attention, he had just flung open the doors of Fuku Wall Street, the sixth location of his fried-chicken chain. And the very next morning, he appeared outside the restaurant’s East Village address to greet sneakerheads waiting in a line for the release of his limited edition Nike Dunks: black denim high-tops emblazoned with a cartoon peach, the logo of Chang’s restaurant empire, Momofuku. The Nike collaboration is the sort of thing that might invite snark -- are we really giving chefs sneaker deals now? -- except that the shoes look great, the line was around the block and, for Chang, the whole thing seems oddly fitting. He exudes a ferocious determination, a force of will more commonly associated with athletes or entertainers than chefs. Over the course of more than a decade, Chang has opened 13 restaurants, many of them test cases for edgy, unproven cuisines, concepts or locations. To date, he hasn’t closed a single one. Not one. In a business legendary for its failure rate, Chang is batting a thousand. On this particular Monday, Chang has called to discuss his latest restaurant venture, Ando. In a career marked by boundary pushing and radical thinking, Ando -- named after Momofuku Ando, the creator of instant ramen and namesake of Chang’s restaurant company, and Spanish for “I walk” -- might be his biggest risk yet. It is, essentially, a restaurant without a restaurant. There are no tables. There are no chairs and no servers. Just a bustling kitchen and an app selling a small menu of sandwiches and salads in the $9-to-$12 range that can be picked up or delivered around a broad swath of Manhattan in 30 minutes or less. That’s right: delivery food. Traditionally the domain of stuffed-crust pizza and strip-mall Kung Pao chicken, and more recently, the graveyard of various startups trying to disrupt the marketplace. So why does a guy with an unblemished win-loss record, five James Beard awards and a two-Michelin-star restaurant (Ko) that’s on a world’s-100-best list -- a guy with his own Nike Dunks -- decide to get his hands dirty with delivery? Here’s what screwed looks like. American restaurants took in around $800 billion in revenue last year, but sales have stagnated at a time when costs continue to rise. The number of independent restaurants is shrinking at a rate of 2 percent a year. For quick-service restaurants -- the industry’s best-performing segment these days, encompassing chains from McDonald’s to Sweetgreen -- traffic is expected to grow by a meager 1 percent in 2017. None of this bodes well for the current order. “How the restaurant industry has worked in the past will not work going forward,” Chang said on The Eater Upsell podcast in June. Of the business that restaurants still manage to attract, more and more of it is coming from customers who prefer to stay home. Delivery orders for prepared foods other than pizza have risen by 30 percent in the past four years, according to the market research firm NPD Group. (Pizza chains dominate food delivery, accounting for about 60 percent of it.) Food delivery is a $30 billion market today, and there’s tremendous room for growth. Morgan Stanley analysts estimate that if consumer appetite for delivery were being fully met, it would be worth around $210 billion. So it comes as no surprise that a slew of tech companies and large restaurant chains are scrambling to grab their piece of the pie. Grubhub, DoorDash, UberEATS, Postmates, Caviar and many others like them provide restaurants with digital portals and on-demand delivery capabilities; McDonald’s, Wendy’s, Buffalo Wild Wings and Chili’s are among the major operators that have begun using those services to get in on the delivery market. And then there are the upstarts. A few years ago, a crew of venture-backed startups materialized -- the major players have been Munchery, SpoonRocket, Sprig, and Maple -- aiming to do delivery food better, faster and cheaper, integrating kitchen facilities with proprietary apps and delivery platforms. Many of the founders started out with no background in food service, which might explain why their businesses tend to look more like tech firms than restaurant companies: big funding, hefty capital investments, aggressive expansion goals, big bets on customer adoption and a greater emphasis on logistics platforms and data analytics than on the food itself. “At a lot of these companies, there are more data scientists than chefs,” explains Erik Thoresen, a principal at the food-­service-industry consultancy Technomic, who has studied the sector. Maybe that’s why of the four large venture-backed startups, only Munchery remains, after raising its latest round of financing at a diminished valuation. Still, with the demand for delivery soaring and Americans becoming ever more discriminating about their dining options, there has to be an opening somewhere. Maybe one ready to be exploited by an actual food expert, a maverick chef known for a healthy gambler’s streak and the insane deliciousness of his food. Which is to say: David Chang. Chang has been tossing around the delivery question since he opened Momofuku Noodle Bar in 2004, partially at the behest of Mario Batali, who loved the ramen but hated waiting in line for it. But Chang didn’t feel that the food on his menus would hold up well enough to offer it outside the restaurant. By 2014, after watching dining habits shift away from sit-down options to fast-casual fare and on-demand everything, he zeroed in on the idea of a restaurant that dispensed with the dining room altogether. The only problem was that he didn’t have the expertise in-house to create the kind of digital platform he’d need. 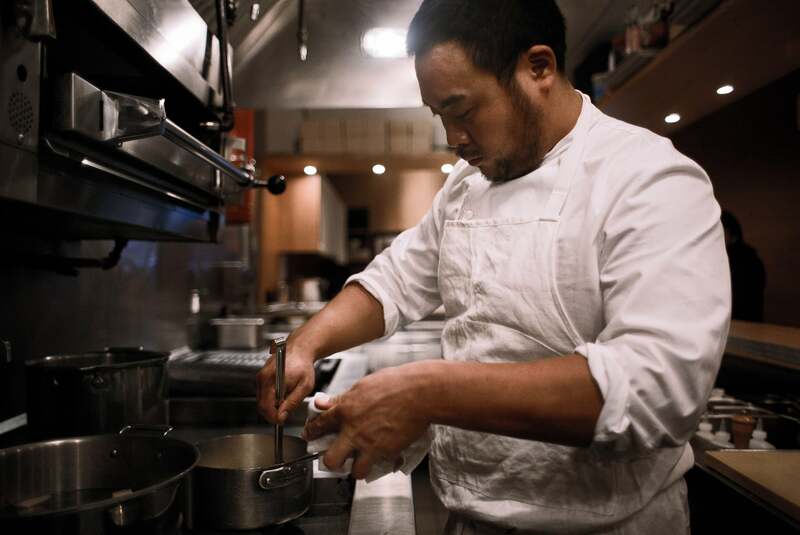 “Momofuku has always been a DIY type of thing, but we felt that where we’d draw the line is on technology,” Chang says. So he did two things: He invested in an existing operation, Maple -- a widely ballyhooed company that sought to handle everything from sourcing the ingredients to delivering the finished dishes -- and he considered launching one of his own. Maple has since closed; the company never quite got a handle on the economics of running such a multifaceted operation. But Chang had a concept of his own that had promise. The way he saw it, a restaurant built for delivery wouldn’t require a pricey chunk of prime retail space in midtown Manhattan. It could run out of an unmarked, out-of-the-way kitchen rented at a fraction of the price. And rather than invest in its own expensive delivery fleet, à la Maple, Chang could outsource the function to third parties -- like UberEATS -- keeping startup costs even lower. That would allow the company to invest in higher wages and benefits for its kitchen staff, which would help with retention in a business famous for employee turnover. But Chang’s biggest idea had to do with the food itself. He would focus on an aspect of delivery that had been largely ignored by both traditional restaurants and tech upstarts: Food that “holds well,” in chefs’ parlance. A menu specifically engineered to withstand delivery. That means making dishes that look, feel and taste as good 30 minutes after they were made as they did the moment they left the kitchen, even after being jostled through traffic on a bike, or sitting at room temperature. The plan fell into place in 2015, when Chang met Hooman Radfar, a partner at Expa, which bills itself as “a company that creates companies.” (Examples of its offspring include Uber and Reserve, a restaurant ­reservations system.) They hit it off and struck a deal, and while Expa set to work developing the tech, Chang tackled the food. His first kitchen hire was J.J. Basil, one of the last people you might expect to find behind a deep fryer. Basil was a sous chef at one of New York’s most avant-garde restaurants, the now-shuttered wd-50, where he developed, among other things, a technique for aerating foie gras that required months to nail down. After wd-50 closed in 2014, Basil did a stint in Charleston, S.C., for the pioneering Southern chef Sean Brock, testing innovations like Mountain Dew vinegar and soy sauces made from heirloom grains. In other words, he was just the sort of tinkerer Chang needed. When Chang ran into Basil in 2015, the latter had returned to New York to scout spaces for a restaurant of his own, only to realize what Chang and others had already sensed: “The era of the 30- to 50-seat restaurant is over,” Basil says. “With rents like that, you would have to charge prices nobody wants to pay. And you’re breaking your back to scrape by.” Chang pitched him on Ando. Intrigued, Basil signed on to be head of culinary and operations. Ando opened for business in spring 2016. When I meet J.J. Basil inside Ando’s 14th Street kitchen, he’s tinkering with several new dishes, including a salad of smoked tofu, romaine, Chinese sausage and creamy dressing -- “our version of a big, dirty salad,” he explains -- and a scorchingly spicy sandwich of mushrooms and charred greens. His kitchen crew is busy assembling orders, using beef and chicken from famed butcher Pat LaFrieda, premium Heritage-brand pork and produce from the Union Square Greenmarket. It’s the sort of scene you might encounter at any well-respected restaurant in Manhattan, only here the challenges are completely unique. Getting food to deliver well, as it happens, is remarkably difficult to pull off. To hit the sweet spot, every item undergoes extensive tasting from Chang, Basil and their full-time R&D assistant (as well as garnering feedback from Ando’s entire office staff, which currently numbers around a dozen) before hitting the menu. Once the food is out in the world, Ando closely monitors customer feedback through the app -- comments on saltiness, spiciness and temperature are the most common -- as well as data like how many people clicked to look at the item, and how many of those people followed through to buy it. Adjustments are made accordingly. Some dishes required months of experimentation, like a fried-chicken entrée, no longer on the menu, that Basil learned to keep crispy over the long haul. (It involved a highly precise recipe for everything from the starch content of the breading to how the chicken was laid in the fryer.) Others were even more elusive, such as chicken fingers. “That’s an example of something that’s really delicious but was just too tough for delivery,” Basil says, with a grimace. The surface of a chicken tender is skinless, he explains, meaning that moisture pushes out through the breading, rendering a soggy exterior. “That item sold really well, but we ended up pulling it because we weren’t happy with it. It just didn’t stay as crispy as we wanted. “There’s no getting around that with a chicken finger,” he adds, almost philosophically. Of course, new businesses -- especially ones trying to break ground in uncharted territory -- are almost guaranteed to face some unwelcome surprises. And in its first year, Ando has had its share. By May, they had opened the second kitchen on 14th Street but were off to a slightly shaky start. So the company hired a seasoned CEO, Andy Taylor. Radfar says he and Chang always knew they needed a third partner -- ideally someone with deep knowledge of fast-casual operations to complement Radfar’s tech background and Chang’s food-trend and fine-dining savvy. Taylor is just that: a veteran operator who was the chief executive of Hale and Hearty Soups and, before that, COO of Pret A Manger in the States. He’s a big get for the fledgling company, highly experienced and very tactical. His first week on the job, he insisted on rotating through positions in the kitchen to get a knack for how everything was done. Then he shut down Ando’s original midtown kitchen, feeling it wasn’t big enough to scale up to meet the neighborhood’s intense lunch rush, and made plans to focus on Ando’s other kitchen downtown. When we spoke shortly after his hire, Taylor told me that his first objective at Ando would be nailing down a firm menu. In July, I tasted several items from the most recent revamp. Basil’s menu has evolved from a scattershot collection of flavor bombs to a compact selection of salads, sandwiches and sides, most with loosely Asian influences, on-brand for Momofuku. (Of the 14 dishes Sutton reviewed, only a cheese­steak and a cookie assortment remain.) Now there’s something for everyone, from a wild salmon and quinoa power bowl with a souped-up green goddess dressing to a fat, hearty meatball sub. And all of it holds about as well as delivery classics like pizza and Chinese. At this point, however, a larger problem has begun to emerge. When Ando launched, Chang and company reckoned that outsourcing delivery to logistics pros like UberEATS would be much more cost-­effective than employing their own couriers. That assumption was flawed. It turns out that while customer demand for delivery is rapidly increasing, so are the costs. Pricing for Ando’s delivery providers -- mostly UberRUSH and a competitor called Homer -- depends on the notion that, guided by the right algorithms, couriers can handle several orders at a time by bundling them from nearby restaurants and delivering to end users in close proximity to each other. But those efficiencies haven’t materialized yet. Meanwhile, minimum wage for couriers continues to rise. “One of the pressures we’re facing is that our delivery partners aren’t as advanced as we need them to be,” Taylor says. Under Ando’s initial model, the cost of delivering an order was about $6, of which the company charged customers $3 and contributed the rest. Taylor thinks that cost could go as high as $10 in the long term. The underlying economics would be similar if Ando employed couriers directly. Taylor is hopeful that as demand for delivery increases, so will efficiency, and costs will eventually come down again. But in the meantime, the business is accepting orders for delivery as well as takeout: In September, Basil’s kitchen on 14th Street got Ando signage outside and a modest storefront with a traditional counter (and cashier). Taylor’s hope is that customers will spring for delivery when the weather is bad or they’re pressed for time, but a takeout option will make the meal cheap enough to be an everyday option. For what it’s worth, Technomic’s Erik Thoresen and the other industry analysts I spoke with believe the opportunity for delivery-only outfits to succeed is legitimate -- and will likely be realized by small players who grow slowly, and are therefore less reliant on raising continual rounds of increasingly scarce venture funding. By that logic, Ando is well-positioned to succeed. The company has raised just a single $7 million round of funding to date, a fraction of Munchery and Sprig’s coffers. Neither Taylor nor Chang has any interest in loading up on investor cash, preferring instead the bootstrapped, everything-on-the-line approach that has gotten them where they are today.